Too many shoes - anyone else have this problem? 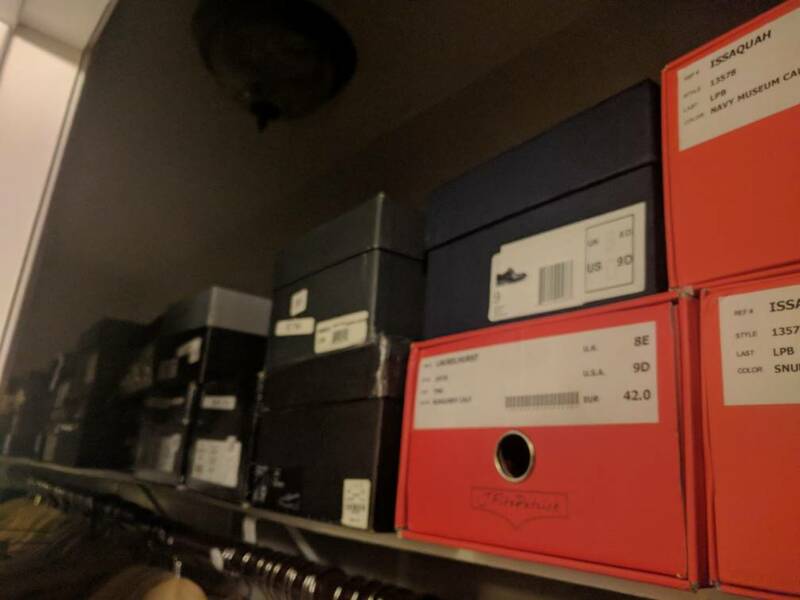 Thread: Too many shoes - anyone else have this problem? I’ve found that it helps to keep a list of what I currently have, along with noting particular styles that I’d like to add in the future. I also try to avoid owning multiple shoes/boots in similar styles & colors. In my opinion, having to spend time on routine care for leather shoes is enough incentive to avoid having a bigger collection. For dress shoes, I’ve got 9, though one is a black cap toe that I only wear for formal occasions. Of the remaining 8, some get more wear in spring/summer and others get more wear in fall/winter. When I’m not in dress shoes I’m usually in sneakers in summer and boots in fall/winter/spring. I think I’ve got 3 or 4 sneakers and 7 or 8 boots, all different colors or styles. Add in two pairs of non-dress shoes, gym shoes, duck boots and insulated winter boots and I’m right around 25. I have 14 pairs I wear regularly and a few I never wear and have no more room for any. I would like to fill a few holes in my lineup and upgrade a few of the ones I have to better versions. I'm afraid I don't understand the question, especially the use of the word "problem" in the title. Seriously, I think having a large variety simply gives lots of options, especially in a region with marked weather seasons. Lots of boots for cold--dress, casual, water-resistant--and a number of sneakers and light-weight loafers for warm weather. Plus multiple other shoes for work and nicer events. If the issue is space, that can always be addressed with creative thinking. OP is right in realizing he has too many shoes. 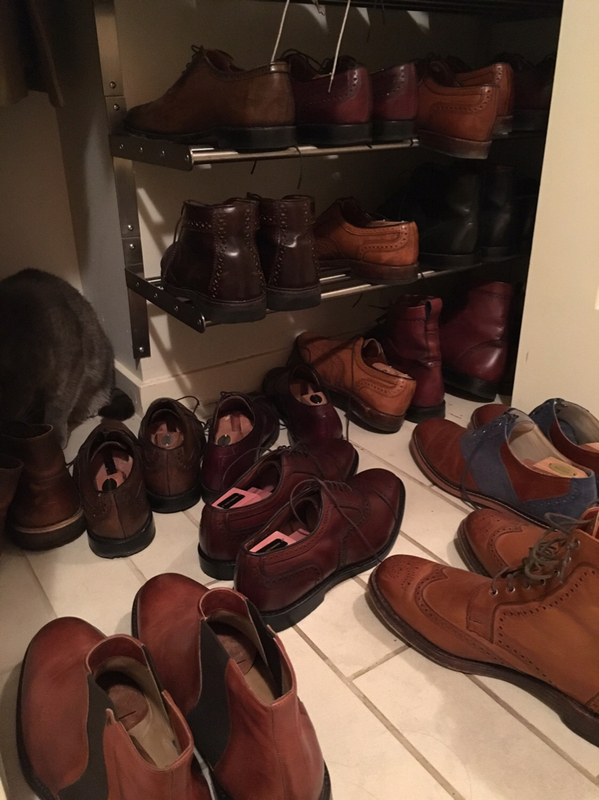 He can easily pick 3 or 4 pairs to wear in a row, and the average non-stylish person would think it's probably the same shoe. "Consumerism becomes excessive when it extends beyond what is needed. When we begin consuming more than is needed, boundaries are removed." "[M]aterialism is associated with lower levels of well-being, less pro-social interpersonal behavior, more ecologically destructive behavior, and worse academic outcomes. It also is associated with more spending problems and debt"
The OP seems like a nice, well-educated guy who happens to like shoes. I somewhat doubt keeping what shoes he has, or even buying more shoes if he so desires, is going to turn him into an introverted, dumbed down, impoverished monster of some type. Yeah, this is a good idea. Keeping a list of what I currently have. When the latest AE sale came up I had to head downstairs and do a manual count/review to make sure I wasn't buying something that I already owned. But space is definitely an issue. I need to share the closet in the photo with my wife, so I can't expand upwards. I'll definitely have to come up with some creative thinking. Ideally, keeping all the shoes in the same room because once they spill out to another room, they tend to be out of sight/out of mind. Shoes are my hobby. So I have way too many than what I need. I do tend to buy quality shoes at the price that most men buy there cheap shoes. I was making a point to Raakish that wanting to keep buying more stuff without checking yourself is not good. But I'm not affected by his shopping, or yours, or OP's, so shop away.